TDR 300 Soil Moisture Probe, Kosmos Scientific de México, S.A. de C.V.
- Redesigned, more rugged probe block - Easily change rod length selection with keypad on digital display When precision irrigation decisions count, the Field Scout TDR Series offers growers a tool to eliminate the guesswork. Based on proven time-domain measurement technology, these portable units accurately measure soil moisture across the full range of soil moisture conditions. Select from the 3.8, 7.5, 12 or 20-cm (1.5, 3, 4.8 or 8-inch) probe rods to suit your desired depth measurement. Install PVC access tubes and take readings deeper in the soil profile. The TDR 300 has two volumetric water content modes; one for standard soils and one for higher clay soils. In volumetric water content (VWC) mode, the meter converts a measured electrical signal into percent soil moisture content using an equation valid over a wide range of mineral soils. In irrigation mode, the meter displays a relative water content (RWC) on a scale of 0 to 100 corresponding to a user-defined upper and lower soil moisture reference level. Water deficit, the amount of water needed to bring the soil moisture content up to the upper reference level, is also calculated and displayed. The reference levels are easily programmed into the meter with the accompanying software. Create up to 2 management sites based on your soil types and crop needs. Use the raw reading mode (measurement period in microseconds) to do soil-specific calibrations. Perfect for Researchers and Consultants! An internal data logger and RS-232 port allow for use with a DGPS for geo-referenced soil moisture measurements. Includes software and PC cable. 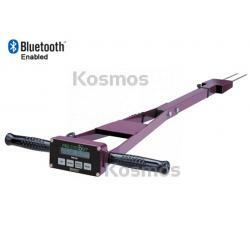 Measurement rods must be purchased seperately for Field Scout TDR products. See the following video about turf management.